IT&E provided support to the Saipan Mayor’s Office for the 2018 Liberation Day Festivities to celebrate and honor the resiliency of our people and culture. IT&E contributed to Saipan’s Pistang Pinoy, hosted by the United Filipino Organizations, which celebrates 120 years of Philippine Independence, the Filipino culture, and the contributions of the Filipino community. 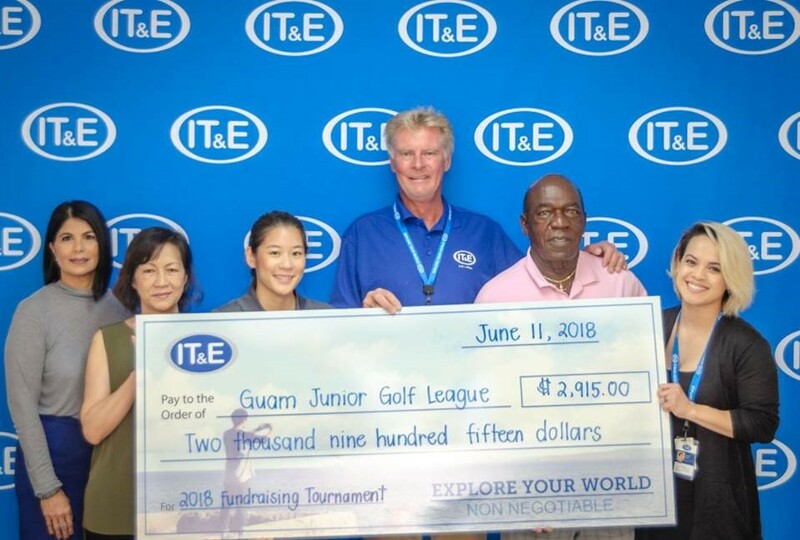 $2,915 was donated and a game was hosted at the Guam Junior Golf League Fundraising Tournament to support the league’s efforts to develop sportsmanship and confidence in the youth through golf. Phone, fax, and internet services were provided to the Northern Mariana Museum of History and Culture. IT&E sponsored the 2018 IT&E Badminton Tournament on the weekends of May 11-13 and 18-20 to benefit the Northern Marianas Badminton Association and its efforts to continue its youth development program and renew interest in the sport. 4 mobile Wi-Fi devices with unlimited 4G LTE data were provided to Guam Spraycation to beautify the island and promote local art and artists. IT&E’s Employee Service and Events Committee volunteered and donated supplies to Kamalen Karidat to provide hot meals to Guam residents struggling with homelessness. A total of $7,527.09 was raised through various employee fundraising efforts for the Relay for Life to benefit the American Cancer Society Guam Chapter. IT&E also partnered with GRMC and IP&E to form Team Purple Carabao and participate in the Relay. Playground equipment was donated to the Mayor’s Office of Rota to be installed in the Sinapalo Children’s Park in Rota. High-speed fiber optic cable for free Wi-Fi was installed at youth centers in the CNMI, including those in Koblerville, San Antonio and Chalan Kanoa, for educational purposes and to keep our youth positively engaged. $8,700 was raised through IT&E booth sales at the Marianas March Against Cancer event and $3,119.36 was raised at IT&E’s signature event, Scavenger Hunt For Life. The funds support the efforts of the Commonwealth Cancer Association. $2,500 in cash and $2,500 in in-kind donations were provided to Saipan’s 23rd Annual Governor’s Tournament of Champions to support island beautification projects. Samsung J5 Pro phones and cellular and data service were gifted to the Mayor’s Office of Tinian to be awarded as prizes for the San Jose Fiesta, which celebrates the local culture and traditions. IT&E remains committed to doing its part to help the community thrive, protect, and develop our youth, promote health and wellness, preserve the environment, and honor the vibrant cultures of the Marianas and Guam. 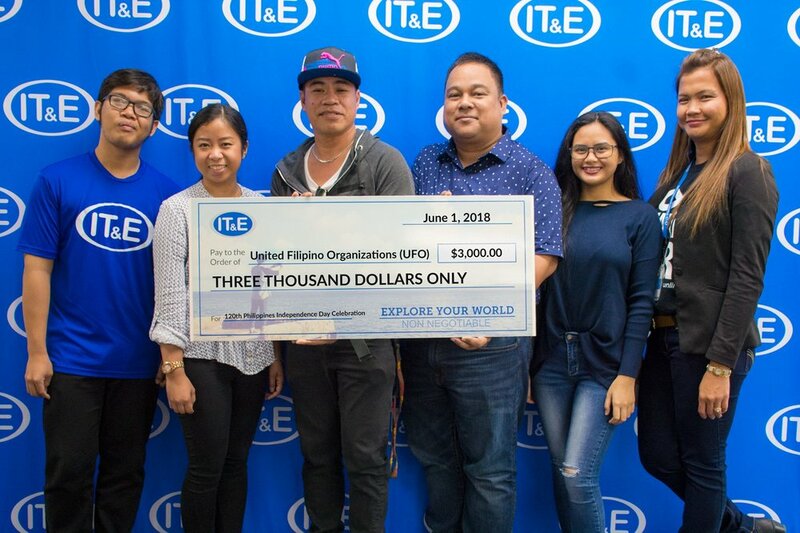 (From left) Patrick Augustin, IT&E Accountant; Edna Nisola, IT&E Marketing Intern; Joel Vallega, Public Relations Officer for Community Events at United Filipino Organization; Marlon Regaton, president of United Filipino Organizations; Hannah Bognot, IT&E Accountant; and Amy Quito-Weiss, business account manager at IT&E. (From left) Janet Aguon, enterprise sales manager of IT&E; Kaoru Camacho of Guam Junior Golf League; Jennifer Shen of Guam Junior Golf League; Jim Oehlerking, CEO of IT&E; Mel Davis, coach of Guam Junior Golf League; and Angela Rosario, director of marketing & product development of IT&E.